Tales From Another World (Best Of Beborn Beton) is the first domestic release from this legendary German trio. After five previous European album releases it was only a matter of time before Beborn Beton made their North American debut. 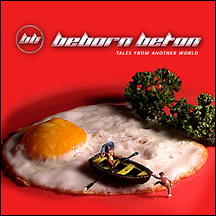 Tales From Another World (Best Of Beborn Beton) is a collection of the Beborn Beton's singles and clubhits. Guaranteed, this exclusive release will enlighten all of those who may be unfamiliar with the bands extensive history and entice those who may have had some exposure. Fans will soon find out why Beborn Beton can be called one of the true pioneers and one of the greatest bands ever to surface from the German music scene.